SEOUL, April 15 (Yonhap) -- President Moon Jae-in said Monday that he hopes to meet again with North Korean leader Kim Jong-un as early as possible, welcoming Kim's latest message on denuclearization talks. Moon stressed that the venue and format of his fourth summit with Kim does not matter, as he seeks "concrete and substantive discussions" on ways to produce "fruits" to outdo those of two U.S.-North Korea summit talks. "Now is the time to make preparations and push for South-North summit talks in earnest," he said in a meeting with senior presidential aides here. He added, "As soon as North Korea's conditions are created, I hope the two Koreas will have another summit without being restrained by the venue and format." It's Kim's turn to visit Seoul, as Moon traveled to Pyongyang last year. 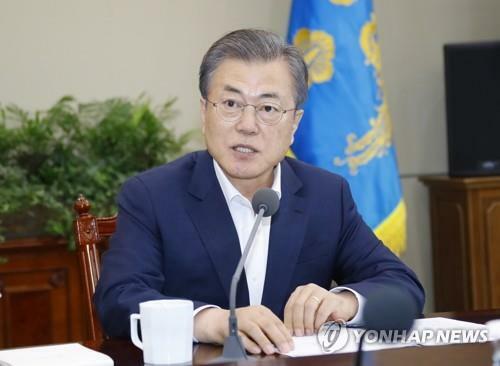 Moon's remarks suggest that he won't hesitate to meet again with Kim at the DMZ village of Panmunjom in a rather casual manner, instead of spending lots of time and effort in gearing up for Kim's visit to Seoul or for another trip to the North's capital. Moon's statement was his first official message on North Korea since his White House summit with Trump. Moon was also responding to the North Korean leader's speech to the Supreme People's Assembly last week, in which he urged the United States to change tack in order to continue denuclearization talks. "As I have done so far, I will make utmost efforts so that another South-North summit will become a stepping stone to make a bigger opportunity and outcome," Moon said. Through his warm approach toward Pyongyang, the liberal president is credited with having paved the way for the Korea peace process, which is still in a nascent stage. It has hit a snag with the no-deal end of the second Trump-Kim talks, in Hanoi in late February, due to a wide gap over the definition and terms of denuclearization. Seated with Moon last week, Trump said he would leave sanctions on Pyongyang in place. He also suggested a step-by-step formula toward a third meeting with Kim. The North's leader pressed Trump to change tack. "It is essential for the U.S. to quit its current calculation method and approach us with a new one," Kim said in the speech, according to Pyongyang's state-run Korean Central News Agency. A silver lining is that both Trump and Kim expressed a desire for continued dialogue. Moon is eager to broker or expedite another round of "top-down" nuclear talks. His aides say he can capitalize on his mutual trust with both Trump and Kim. He's reportedly planning to send a special envoy to Pyongyang in the near future in a bid to lay the groundwork for another inter-Korean summit. In 2018, the president dispatched his top security advisor, Chung Eui-yong, and National Intelligence Service Director Suh Hoon, to the North Korean capital. 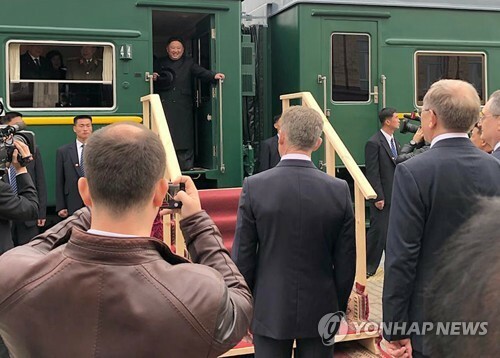 While Moon is scheduled to leave for Central Asia on Tuesday, Chung plans to stay in South Korea, Cheong Wa Dae officials said. The talk of Moon's special envoy comes as critics question his role between Pyongyang and Washington, especially since the North Korean leader's related comment reported over the weekend. He effectively urged South Korea to take the North's side as a "party concerned," rather than passing itself off as a "mediator or facilitator." Moon did not touch on the special envoy issue at the outset of the session, which reporters were allowed to cover. Meeting with a group of newly promoted military generals at his office later in the day, the president cited the need to turn the current detente into a "complete peace." 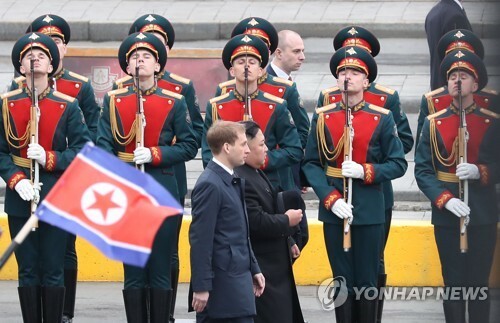 "(Peace) has not been firmly established," he said, instructing them to do their best to make the military stronger and fully ready to deal with security conditions that can change anytime. The main opposition Liberty Korea Party's (LKP) attacks against the Moon administration's North Korea strategy showed no signs of letting up. 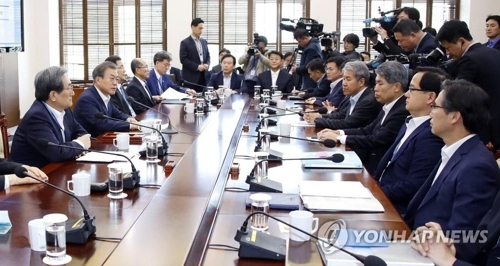 Rep. Na Kyung-won, the LKP floor leader, called on the president to cross the members of the current security team off the list of candidates for the envoy mission and choose a "messenger" to present a resolve for denuclearization and pressure. "(President Moon) should become a president to protect the security and interests of the (South Korean) people, not a person involved to support the interests of the North Korean regime," she said. 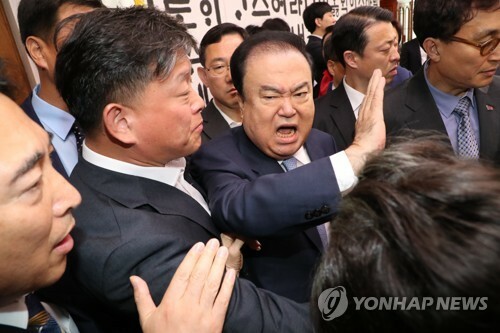 A group of ruling party lawmakers hosted a closed-door meeting with a North Korea expert. 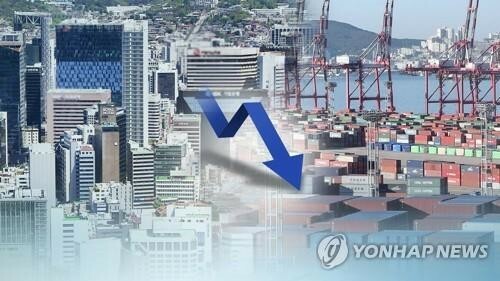 Koh Yu-hwan, a professor of North Korean studies at Seoul's Dongguk University, was quoted as saying that the government does not need to be preoccupied with the so-called top-down approach. 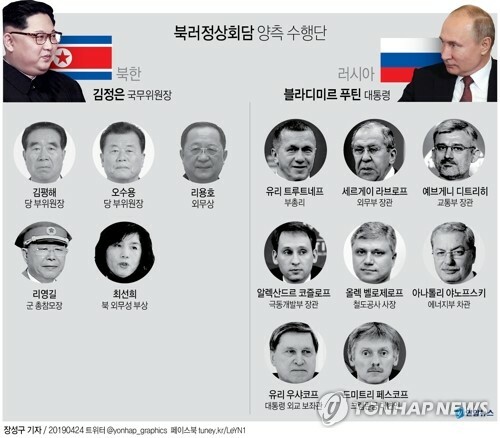 Now that the strengths and limits of the top-down method have been revealed, it's worthy that (the government) considers the operation of a three-way working group of South and North Korea and the U.S.," he said, according to Rep. Kim Han-jeong of the Democratic Party (DP).